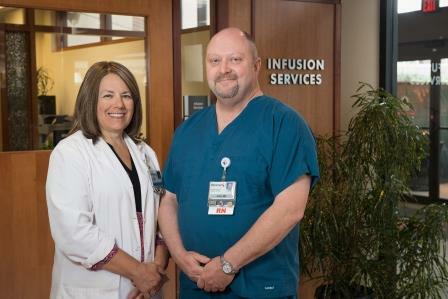 Registered nurse John Oaks has experienced Memorial’s culture of care from two different angles: as a provider and as a patient. A video featuring Oaks, who works in Memorial’s Infusion unit, was recently shown at employee meetings. He told his story as a way to thank the co-workers who helped save his life. But that story struck a different chord with another colleague-turned-patient, putting a spotlight on the connections forged by Memorial employees with each other and with patients in their care. Previously a patient at Prairie Cardiovascular, Oaks recently began seeing Adeeb Ahmed, MD, a cardiologist at Springfield Clinic. He was experiencing fatigue, chest discomfort and shortness of breath. After a stress test showed strain on his heart, Dr. Ahmed inserted three stents into his coronary arteries in a procedure that Oaks believes saved his life. 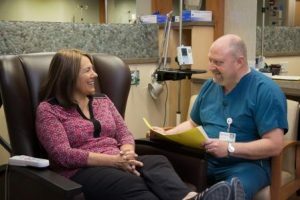 When footage of Oaks began rolling at the employee meeting she attended, clinical nutrition supervisor Becky Smith recognized him right away as one of the nurses who’d cared for her during treatment for breast cancer. “When he told his story, I thought, ‘Wow, I’m so glad someone took care of him so he could take care of me,’” she said. Smith was diagnosed with breast cancer in September 2016, following a routine mammogram. Until that diagnosis, she’d never logged a single sick day in her 13 years at Memorial. “This just caught me out of the blue,” she said. After surgery in the fall, she began chemotherapy at Springfield Clinic but decided to transfer her care to Memorial Medical Center so she could return to the job she loves more easily. It was in Infusion where she met Oaks. “He was just great,” she said. “He always had a smile on his face.” But the whole team, from nurses to volunteers, helped put her at ease with their expertise and caring. “All of the nurses there are fantastic,” Smith said, noting that in addition to providing top-notch care, they also helped encourage her and lifted her spirits when she was at her lowest. Oaks, who came to Infusion almost four years ago after roles in the Emergency Department and Neurology, said teamwork is central to their philosophy. “We feel that we work better as a team than as individuals,” he said. They see the same patients throughout their treatment and come to know them on a personal basis. He said they use that personal connection, as well as a sense of humor, to help patients through what can be a dark time. As a fellow Memorial employee, Smith said she felt an automatic connection with the Nursing team. But when she saw how they interacted with the other patients, she realized they were building that same connection with them, too. “They treat you like you’re family,” she said. Smith, who plans to retire June 1, 2017, finished her chemotherapy treatments six weeks ago. She’s always appreciated Memorial’s philosophy of care, but seeing that care from a patient’s point of view gave her a new perspective. “I felt very proud of the fact that we work somewhere where our nurses are so great and do such a good job,” Smith said. Oaks said that he also benefited from that change of perspective. As a nurse, he’s always tried to ensure patients understand what’s happening and feel involved in their treatment. “I didn’t realize how important and comforting it was until someone did that for me,” he said.